In the Pre-Reception at our private school in Barnet we have been learning about the people in our environment who help us and who we learn from. We were very lucky to have some visitors who told us about their jobs and a couple of visits from a Mum who helped us to understand more about Jewish festivals and how they are celebrated. PC Michaels (Miss Pavlou’s son) came to visit us one morning telling the children all about what it is like to be a Police Officer and how policemen and women are there to help us. 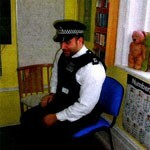 The children were then able to try on his reflective coat and to look at his radio and telephone. 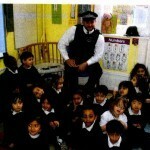 They were also able to have their photograph taken with PC Michaels. 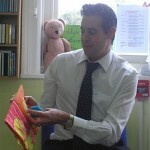 We also had a visit from Rob (Mr Durling) who is a dentist. He told us how to look after our teeth and read us a story about how important it is to brush your teeth and which foods are healthy for us. We counted how many teeth we have got and talked about getting a visit from the Tooth Fairy when we are older. Rob showed us how to brush our teeth carefully and we were also given a small bag with a toothbrush, timer and stickers to take home. Thank you Rob for coming to see us. Hannah (Mrs Greenfield) came to see the Barnet prep school Pre-Reception twice this year to talk to us about the Jewish festivals. We were able to taste some of the special food and we especially liked dipping pieces of apple in honey, it tasted really sweet. This signified having a sweet new year. 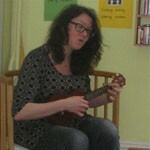 Hannah taught us some new songs and we sang them with her whilst she played her ukulele. We loved learning the new songs thank you Hannah for coming in to the Pre-Reception at our private prep school in north London.